Is this Hell in Transit? In ways complex, subtle and surreal, Christian Petzold has crafted another enthralling think-piece / thriller with Transit. When troubled opportunist Georg (Franz Rogowski) agrees to deliver papers to a writer looking to flee the fascist take-over of France and quickly finds the writer has committed suicide, a sea of events take place leading to Georg to Marseilles where he becomes entangled in the stories of a multitude of refugees, including the dead writer’s wife, Marie (Paula Beer), who knows not her husband is dead and has fallen into the arms of an altruistic doctor (Godeheard Giese) who passed up a passage to Mexico to stay with her while she still pines for her husband to join her. While this bizarre love triangle (or is it a square?) 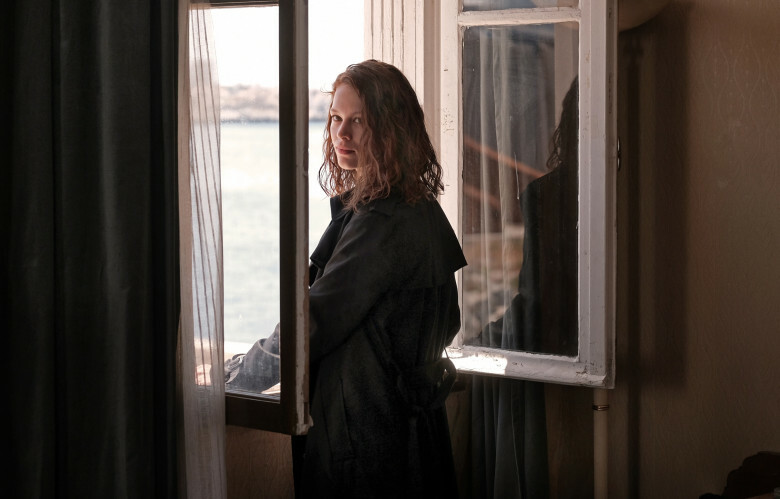 built upon stolen identities and pining for those already passed on (both literally and metaphorically) is enthralling enough on its own, Petzold layers in side stories to enrich Georg’s tale. When he first arrives in Marseilles from Paris, he has to deliver bad news to the wife and young son of his traveling companion who died in transit, and he quickly becomes immersed in their loneliness. The woman (now widowed) is mute and deaf, and the boy (now orphaned) is just looking for someone to play soccer with, and both had been waiting in Marseilles for the boy’s father who was to help them all flee to the mountains. Meanwhile Georg gets distracted by his own conflicting drives to flee and stay. His feelings for the boy (who has an asthma attack after Georg takes him to an amusement park) are what lead him to the doctor and Marie, and when he falls for Marie, too, his feelings and anguish only become more twisted. Meanwhile other refugees come and go from his stage (a sickly conductor, an architect stuck with her client’s abandoned dogs), all longing for someone to listen to their story, just as Georg ends up telling his story to the proprietor of the restaurant where he, Marie, and the doctor frequent.